There has been a campaign online that gets people to blindfold friends and family members and have them do something that they would do on a regular basis as a blind person. For example going to the gym, cooking a meal, walking down the street. I think the intentions were good with this campaign however it missed the mark for me. Here is why, it never gives a positive view of the disability. If you were to put on a blind fold and walk around you are not going to get a realistic view of my life, you are however going to pity me at the end. Since you do not have any of the skills to be a successful blind person you are going to think that it is horrible and you would never be able to do it all day every day. How is this helping to make people understand that our lives are full and amazing even with the lack of sight ? It doesn’t it is that simple ! The last thing that I want is pity, I live a full and amazing life. I am successful and independent and would not change a thing about my life. Please don’t put on a blind fold and think that you have any idea what my life is like because you do not have a clue. Do not pity me but see me for a person who has many things to offer the world around me. I am a very capable person and that is what I want people to see, not think that everyday tasks are hard because they are not. I do them without vision which is simply different you are a visual person and are trying to things visually with a blind fold on, that will never end well ! If you are not convinced that I live an amazing life please subscribe and let me show you. I hope you are all well, I wanted to share an experience that I had today. I went for lunch just myself and my Guide Dog Rick, I needed to get out of the house and it was a beautiful day. We had a fabulous lunch at a local cafe. In this cafe they also have a boutique for women’s clothing and things. It is a great little place for our community and I love to go every now and then. After we had lunch I thought I would take a look around at the clothes. Yes I like to “look” around at clothes and things. I usually just feel the fabrics and the cut of the clothing and if it feels like something I like I will ask what the pattern or colour is and for more detail. As I was feeling around the store at some of the clothing a lady approached me and said how beautiful Rick was. I said thank you and we had a good conversation about Rick and how amazing service dogs are. As she was going to leave she told the other lady with her to watch her step. She then turned to me and said watch your step to dear. The other lady then says “oh she isn’t completely blind.” I said well actually I am, but thank you. She then began to tell me that she watched me while I had lunch and I ate just fine and used my phone. These types of comments come often and they used to really make me mad. It is like they are saying that I am faking it. However, anger gets me no where. These kinds of comments now just fuel my fire and passion to make the world understand blindness more. I am able to eat and not make a huge mess because I am an adult I am aware of how a fork and knife work and I am also aware of where my mouth is. Had she been watching carefully she would have seen me ask the waitress where things were on the table and also she would have seen me using my knife almost like a cane around my plate. She may have also noticed that after I tried to pick up my sandwich stuff fell out and I did not want to wear it so I cut it up with my fork and knife. Had she been listening closely she would have heard that my phone was talking to me. 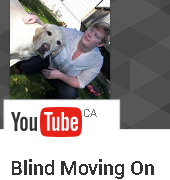 These comments are so unnecessary, I wish people would realize that the way they perceive blind people they have learned through the media and they are not accurate depictions. Even though these comments get under my skin, I know that the only way to change the way society sees me and other people who are blind is to live my life to it’s fullest. One day if I keep working at it people will understand blindness and the misperceptions will be gone. A pipe dream I am sure but I am also very stubborn and determined.